A reference to rock which has been fragmented in place as a result o mechanical processes or orogenic (mountain formation) forces . 1. Broken in place, said of rocks having a broken or brecciated (rocks with sharp-angled fragments) structure due to crushing, in contrast to those of brecciated materials brought from a distance. 2. Of rock, fragmented in place by folding due to orogenic forces when the rock is not so heavily loaded as to render it plastic. 1. Using a strong, pressurized, steam-heated vessel, as for laboratory experiments, sterilization, or cooking. 2. Operating a device for heating substances above their boiling point; used to manufacture chemicals or to sterilize surgical instruments. 3. To place into or to put into an autoclave. 1. An automatically regulated apparatus for the sterilization of objects by steam under pressure. 2. A device for heating substances above their boiling point; used to manufacture chemicals or to sterilize surgical instruments. A surgical clip applied with an automatic staple. It is usually employed for wound closure in place of a suture. This is a proprietary name (the patented brand name or trademark under which a manufacturer markets a product). The process of using a computer to convert automatically a symbolic code into a machine code. An organic substance; such as, a hormone, produced in one part of an organism and transported by the blood, lymph, or sap to another part of the organism where it exerts a physiologic effect on that part. In optics, the process used in an autocollimator. An instrument combining the functions of a telescope and a collimator for detecting and measuring very small deviations in a beam of light. A collimator is a fixed telescope for use in collimating or adjusting the line of sight (of a telescope). 1. A reference to an organism that consumes its own feces. 2. The action of an organism that eats its own excretion. In statistics, a property displayed by some sequences of adjacent items not being independent of each other. Autocorrelation is a mathematical tool used frequently in signal processing for analyzing functions or series of values; such as, time domain signals. It is the cross-correlation of a signal with itself. Autocorrelation is useful for finding repeating patterns in a signal; such as, determining the presence of a periodic signal that has been buried under noise, or identifying the fundamental frequency of a signal which doesn't actually contain that frequency component, but implies it with many harmonic frequencies. 1. A monarch of uncontrolled or unrestricted power; one who rules with undisputed jurisdiction: The new owner of the company Jake worked for was an autocrat who demanded absolute obedience by his employees. 2. A person who is invested with or assumes unlimited authority with any relationship: Adam's daughter, Susan, called him an unreasonable autocrat. 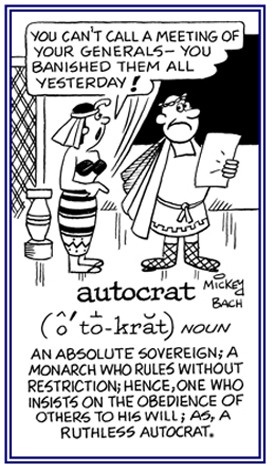 Of the nature of, or pertaining to someone who has absolute authority; a despotic ruler. 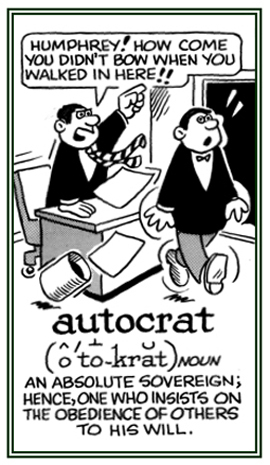 In autocratic manner, absolutely, despotically. Showing page 7 out of 24 pages of 354 main-word entries or main-word-entry groups.